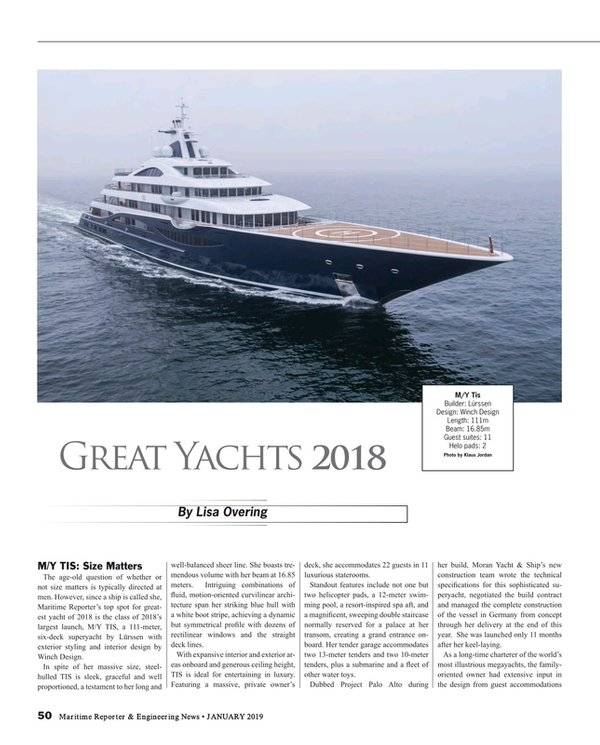 While the task to name only five 'Top' yachts of the year, Maritime Reporter & Engineering News' Lisa Overing gives it her best shot in the January 2019 edition. The age-old question of whether or not size matters is typically directed at men. 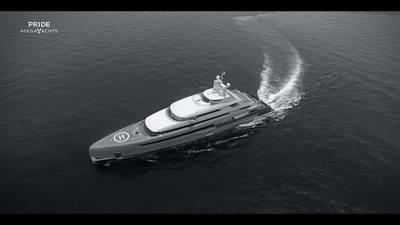 However, since a ship is called she, Maritime Reporter’s top spot for greatest yacht of 2018 is the class of 2018’s largest launch, M/Y TIS, a 111-meter, six-deck superyacht by Lürssen with exterior styling and interior design by Winch Design. In spite of her massive size, steel-hulled TIS is sleek, graceful and well proportioned, a testament to her long and well-balanced sheer line. She boasts tremendous volume with her beam at 16.85 meters. Intriguing combinations of fluid, motion-oriented curvilinear architecture span her striking blue hull with a white boot stripe, achieving a dynamic but symmetrical profile with dozens of rectilinear windows and the straight deck lines. With expansive interior and exterior areas onboard and generous ceiling height, TIS is ideal for entertaining in luxury. Featuring a massive, private owner’s deck, she accommodates 22 guests in 11 luxurious staterooms. Standout features include not one but two helicopter pads, a 12-meter swimming pool, a resort-inspired spa aft, and a magnificent, sweeping double staircase normally reserved for a palace at her transom, creating a grand entrance onboard. Her tender garage accommodates two 13-meter tenders and two 10-meter tenders, plus a submarine and a fleet of other water toys. Dubbed Project Palo Alto during her build, Moran Yacht & Ship’s new construction team wrote the technical specifications for this sophisticated superyacht, negotiated the build contract and managed the complete construction of the vessel in Germany from concept through her delivery at the end of this year. She was launched only 11 months after her keel-laying. As a long-time charterer of the world’s most illustrious megayachts, the family-oriented owner had extensive input in the design from guest accommodations to her propulsion package selection and the crew area, realizing exactly which features and amenities were paramount for his cruising lifestyle. S/Y Black Pearl Photo courtesy of OceancoThis landmark sailing yacht by Oceanco is truly unique. 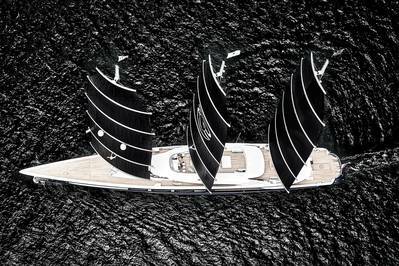 Known as Project Solar during her build which was shrouded in secrecy, Black Pearl is the world’s largest Dynarig sailing yacht at 106.7 meters and 15-meter beam. Designed by Dykstra Naval Architects with three 70-meter carbon masts and an air draft of 70 meters. Her sail area is subdivided into smaller, lesser loaded sails that can be set or furled with the press of a button, setting 2,900 square meters of sails in only seven minutes. As the brainchild of a dream team of designers including Ken Freivokh Design, Nuvolari Lenard and Villate Design, Black Pearl exemplifies adventure on the seas and has a DNA all her own. BMT and Nigel Gee collaborated with Oceanco to create Black Pearl’s hybrid propulsion system and waste heat recovery. In addition to wind power, she is powered by 2 x 1080kW MTU’s / 2 x 400kW electrical propulsion motors. She has a single level engine room with regeneration mode under sail. Her accommodations include a master suite, two VIP suites, two double guest cabins and a full beam beach club that converts into a cinema. A multi-level central atrium includes an all-glass lift rising alongside the central mast, contributing a feeling of vertical integration between the decks. Her seven-meter draft includes approximately four meters of keel, 80-percent of which is filled with lead and the top part with fuel tanks, keeping her weight low. Her massive masts are actually in proportion to the length of the vessel overall. About 50 bolts around the outside of the rig transfer the torque rotation unit into the mast to rotate the mast as required to set the angle of the yards for the wind. With the right wind and the right seas, Black Pearl could reach 30 knots. With regeneration under sail, she is predicted to make a transatlantic crossing with no fuel use. Black Pearl is a real gem of a vessel with exceptional performance, possibly the single, most revolutionary yacht of 2018. Competing with 40 other new superyacht launches, 90-meter DAR won 2018 Monaco Yacht Show Best Exterior Design and Finest New Superyacht Award. With modern exterior styling by Luiz DeBasto, her profile is long, sporty and lean. DAR reflects the latest advances in glass technology with her superstructure completely finished in reflective glass. The upper deck salon yields panoramic floor-to-ceiling views port and starboard.The sophisticated interior by Nuvolari Lenard accommodates 14 guests and 31 crew. A dedicated to owners deck was designed with privacy in mind. The owners’ private balconies offer a cozy indoor/outdoor living feature as well as incredible views. The owner’s deck also includes a private, forward-facing Jacuzzi. During the build period, DAR was dubbed Project Shark because the aerial view of her wing stations resembles a hammerhead shark. The mast in profile is shaped like a fin, contrasting with the flowing rhythm of the hull. “The profile has a unique sense of contrast and homogeneity between the dark glass and the white balconies, providing a constant exchange in shape and lines between the two elements,” said Luiz DeBasto. The prevailing theme on DAR is nature, with blossom cascades, feathers, fish and waves expressed by tasteful combination of details and finishes. The interior woods include different shades of sycamore fiddleback, small details in tinted Brazilian carballo wood and maple bleached gray. Other accents include bas-reliefs; metallic surfaces and 3D-cut leather panels. M/Y Illusion Plus Photo courtesy Pride YachtsThe number 88 symbolizes fortune and good luck in Chinese culture, which bodes well for Asia’s largest launch ever, M/Y Illusion Plus, an 88.5 meter luxury motoryacht launched by Pride Yachts in China. She was bestowed best interior design at this year’s Monaco Yacht Show Awards and was also nominated for finest new superyacht award and best exterior.Illusion Plus is a real stunner with four interior lounges. The main saloon is a duplex with a grand, offset rectilinear staircase punctuated with hidden lighting and mirrors, giving the already high 5.5 meter ceiling the illusion of extra height. Her amenities include two Jacuzzis and a beauty salon, accommodating 12 guests in 8 cabins. With a beam of 15.4 meters and a draft of 4 meters, Illusion Plus has a unique plumb bow, steel hull and aluminum superstructure with a six deck arrangement. With an intended build time of 3.5 years, she was conceived in 2007 on the precipice of the recession by Timothy Saunders and his team, then partner of Rainsford Saunders Design. The interior design was ultimately completed by Sinot Exclusive Yacht Design. Saunders’ industrial and automotive design background is evident in her exterior styling and propulsion, fitted with a powerful, cutting edge Diesel Electric Rolls Royce power plant and Azipull Pod Drives. “This hybrid vessel is capable of great speed, efficiency and accurate maneuvering - not to mention a DP0 Dynamic Positioning System - all of which may be precisely controlled at the touch of a joystick” said Saunders. Some 11 years after developing her original lines, Saunders is pleased to see his creation launched as an iconic, timeless megayacht. Illusion Plus is listed for sale, asking $145 million. Consummate yacht owners John and Jeannette Staluppi named their latest superyacht Spectre after yet another James Bond spy film, just as their 18 other superyachts were monikered, including Benetti’s Quantum of Solace and Diamonds Are Forever. M/Y Spectre exudes sportiness as a 69-meter superyacht with a steel hull and aluminum superstructure arranged on five decks. Benetti’s interior design is reminiscent of a French, art deco theme. The sole in the main saloon resembles Liberty-style flooring in a Paris resort, with symmetrical forms and clean-cut geometrical patterns enriched with Armani fabrics and modern touches. Dark woodwork, sideboards and closets, with glass mirrors, white marble and white leather matching the deckheads for a strikingly, elegant contrast. Featuring a swimming pool and a touch and go helipad, Spectre accommodates 12 guests in unparalleled comfort. The layout features two owner’s cabins - one with a private terrace, a sun lounging area and hydromassage tub. The epitome of ultimate luxury, Spectre features a swimming pool, touch and go helipad, elevator to all decks, beach club, spa and gym. Giorgio M. Cassetta designed the flowing, contemporary exterior contours with a long bow and extended superstructure. The lines of the Hi Speed Cruising Hull by Mulder Design deliver maximum navigational efficiency, with a range of 6,500 nautical miles at 12 knots and a top speed of 21.2 knots, 30-percent more than a traditional displacement hull with an anticipated 30-percent lower fuel burn on crossings. Mulder fitted Spectre with the new Ride Control technology by Naiad Dynamics, significantly increasing stability during navigation and comfort on board with the help of four stabilizing fins and three vertically-adjustable blades. Spectre is listed for sale at $73.9m.